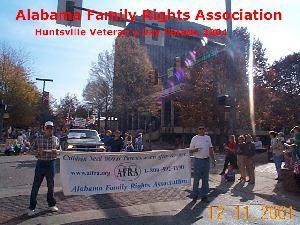 AFRA participated in the Huntsville, Alabama 2001 Veteran's Day Parade. 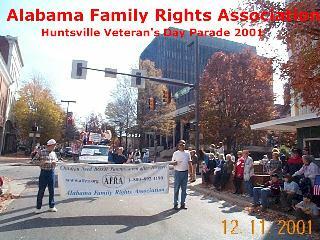 We had a dozen or so people show up, including several children, for AFRA. The weather was PERFECT and we had a wonderful time. We got the AFRA message that "Children Need Two Parents, Even After Divorce" out to thousands. We even made the local TV station coverage. 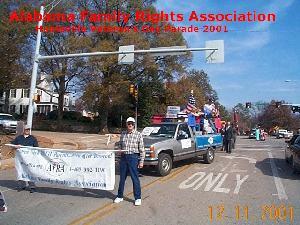 WAFF was very supportive of our participation and we look forward to next year's Veteran's Day Parade. At last, we start to parade! No legal advice is given on this Webpage and/or Website. In accordance with Title 17 U.S.C. section 107, this material is distributed without profit or payment to those who have expressed a prior interest in receiving this information for non-profit research and educational purposes only. 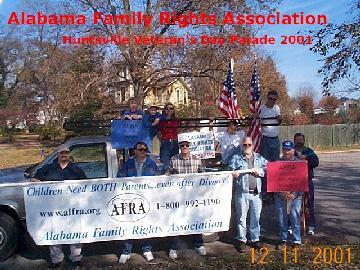 This Website is sponsored by the Alabama Family Rights Association (AFRA). For website information, changes, or updates, please send comments to: ALfra@rocketmail.com. Let us create a web site for your business. We're fast, efficient, and effective!